We offer sustainable solutions for your problems with our modern, prophylaxis-oriented concepts. Our group practice Dr. Bauder & Dr. Fuchs-Martschitz exists since 1999 on the same location: Jochbergerstraße 98, in Kitzbühel. From the very beginning, our aim has been to ensure optimum patient care. This applies to both the medical care including the complete range of treatments as well as the equipment and service quality. Our modern dental practice features a high degree of comfort, state-of-the-art technology, a pleasant atmosphere, air-conditioned treatment rooms as well as excellent standards of hygiene. Our ultimate aim is to create an environment in which you feel completely safe and at home and can put your unconditional trust in optimum care. We endeavour to provide our patients with the best care in all respects with continuous development of treatment methods and our quality management system – implemented since 2001 – with ISO certification. Our practice is open throughout the year which means we can also respond quickly to emergencies. Our practice is run exclusively for private patients to allow us to implement modern treatment concepts. Patients with statutory austrian health insurance are refunded with 80% of the statutory health insurance company rate. Dental work is much more than just repairing cavities. Dental care is not only important for a healthy mouth, but also for your general health and well-being. In the past, dentists did little more than fix the rapidly advancing deterioration of decay and gum disease due to neglect. That means dentists were primarily reactive. Dentistry was not about preventing oral decay and gum disease. Our philosophy of treatment is to offer the utmost quality of care and service in dentistry with a strong focus on prevention. The importance of a preventive approach was shown by two Scandinavian scientists (Prof. Axelsson, Prof. Lindhe) in their study performed in 1981: their 15-year long longitudinal study of adults showed that preventive programmes had led to an increase in the number of remaining teeth in 65-year-old patients by more than 15% and a reduced loss of periodontal support by more than 20%. This study clearly shows that prevention forms the basis of modern dental care. We established in our practice a concept that focuses on prevention and sustainability. Our aim is that our patients do not have to show up in our dental office with recurring damages and unnecessary pain. Therefore, we specialise in preventive care and offer an extensive dental health programme which is based on 4 pillars. In a first step we carefully evaluate your oral health down to the smallest detail to determine the treatment approach that best suits your needs. The right plan is essential to providing appropriate and effective dental care. After assessment important information for your personal decision making in regard to further procedure are for your availability. In a second step we discuss all the findings and possible treatment plans with you as well as your concerns and wishes. We also provide you with an estimate for the various treatment plans and options. You know the advantage and disadvantage as well as risks of the different possible treamtent possibilities and costs are explained and clear to you. Steps which you decided for are undertaken and realized by the dentist of your trust. Depending on your oral status we present you with a personalised oral care programme. Regular professional cleaning and checkups are essential for good oral health as well as your maintaining up a good routine at home to keep your teeth and gums healthy (so called Compliance). Regular oral care at home as well as appointments at your dentist for controll- and prophylaxis enable sustainable dental health. With our treatment plan and your self-care routine we can prevent, detect, treat and eliminate oral problems. To prove that we firmly believe in our concept of preventive care we give all customers who participate in our dental hygiene plan (checkup and cleaning every 6 months) a 5 year extended guarantee on all exclusive dental prostheses. Let us create a healthy dental future together! Within the last 15 years technological improvements and treatment spectrum of modern dentistry have expanded and the service spectrum multiplied. You find significant improvement examples in the special expert fields of parodontology, implantology and computer-aided treatment methods. Taking asthetic treatment possibilities as an example: the nearly invisible brace or safe implants without section is possible. Years ago no-one thougth this would be possible. We consider it as particularly important to professionally offer all useful developments and innovations in our treatmentrepertoire. Being able to do so we invest constantly in divers ways (Employees, instruments, devices, material, personal engagement). Besides this asks for high national and international advanced education and training effort. Professional approach like this makes it possible to act „State-of-The-Art“: The usage of all matured treatment methods in an optimal combination for the individual situation of our patients within the more and more specialized field of modern dentistry. Over the past two decades dramatic changes have occurred in the scope of dental treatments and services available. Examples of fields of dental care in which great advances have been made include periodontology, implantology and computer-aided treatment methods. Innovations such as clear braces that are almost invisible have greatly reduced the reluctance and hesitant approach that most people have towards orthodontistry. 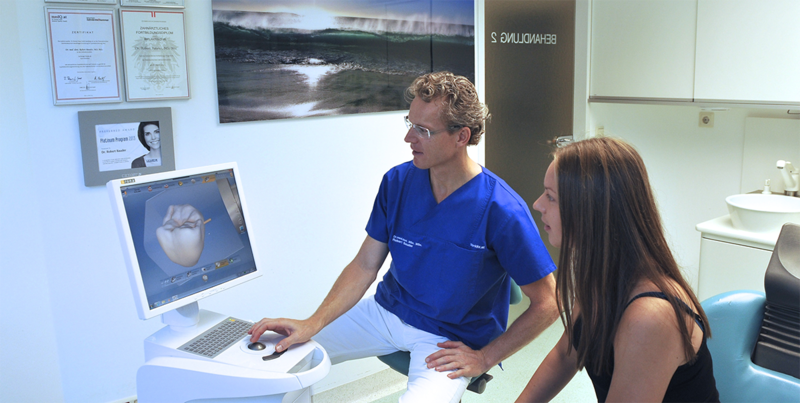 We take pride in offering state-of-the-art treatment methods and equipment. We only use highest quality tools and materials and are committed to continued training of our staff to ensure that you achieve optimum oral health, function, comfort and aesthetics. Our staff aims for our patients’ maximum satisfaction. We want our well-informed patients to receive state-of-the-art treatment. The philosophy of Dr. Robert Bauder and Dr. Fuchs-Martschitz ist to focus on prophylaxis (preventative measures) rather than reparation treatments. We are achieving this through an ideal working environment, as well as reasonable treatment plans, which are being executed by highly qualified, motivated and content employees to meet your needs. We think about and work for your oral health through a holistic approach. Through extensive information that patients provide about themselves and that colleagues share with us, we are trying to create an appropriate consciousness about the questions at stake. For your well-being, we also offer high-level facilities and regularly invest in our employees’ training. The economic viability of our practice ensures that this quality is sustained. The personal satisfaction of the entire staff is key to our success. Through continuous improvements for our patients, we are committed to being not only a dental practice, but also a modern service provider for qualitative treatments. We know how important your smile is for you and a beautiful, healthy smile is our goal for every patient. It is our aim to provide the highest quality dentistry together with the highest level of personal service. We take the time to listen to your concerns! We consider this througout the process when it comes to your wishes and needs concerning the planning and the execution of time-schedule. We place great emphasis on state-of-the-art equipment as well as a highly qualified and continously trained staff. We take great pride in our ability to provide first-class dental service and our satisfied patients are our best source of advertising. We are also available on weekday evenings and Friday afternoons. We sell all kinds of oral hygiene products including electrical toothbrushes, floss, interdental brushes etc. It is of utmost importance to us to provide the best possible quality for our patients both in medical and organisational terms. For that reason we established a quality management system in our practice based on two years of work and research 1999-2001. 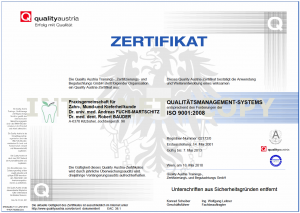 Our quality management system was first certified according to the new norm ISO 9001/2000 by the ÖQS in March 2001. 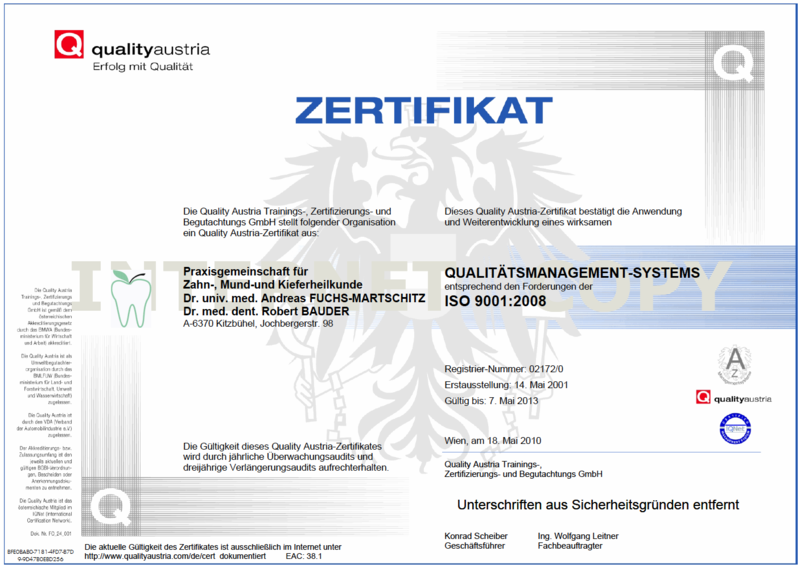 We are proud to be the first dental practice to have introduced a quality management system according to this norm. In 2009 we updated our certification to the new standards according to the ISO 9001/2008 norm. All proceedings, whether medical or organisational, are being well regulated and adopted to our patients needs. The goal of this system is continuous improvement. Data for evaluation is collected through regular patient surveys, surveys of employees as well as recording of mistakes. Numerous evaluations of those questionnaires through a variety of institutes showed pleasing results that showed a performance above average with regards to other dental practices: For overall patient satisfaction we were awarded the grade 1,1 (on scale from 1 (best) to 5) and the average waiting time amounts to 5 minutes only.